Moses Sweetland’s family was among the original settlers on Sweetland Island – a fictional place off the coast of Newfoundland – or so he tells the government agent who comes to convince him to move. Times have changed and what with the fishery and lighthouse being long gone, the expense of keeping a few families that far away from the mainland is prohibitive. The compensation is quite fair but everyone on the island has to agree to the move or it won’t happen. The government is not going to be held responsible for a single lunatic alone on an island. So every family has signs except Moses and his neighbor, Loveless. Too bad, Moses is determined to stay on the island – even when he gets threats, some veiled, some violent from his neighbors. But the Newfoundland government is also determined to end the habitation of Sweetland Island. The government is going to cut off all services like ferry service, telephone, internet, etc. They are going to cut the whole place off. Still, Moses will not leave. The whole island is leaving or dying – the seabirds, the buffalo, family members and friend – then the memory of an old shipwreck of a few people, the death of a newborn calf. It’s all quite symbolic – perhaps a bit heavy-handed. Jesse, a nephew with Asperger’s (or something) also wants to stay on the island with Moses – sitting in classrooms is really not for him. Clara, Jesse’s mother and Moses’ sister, wants to send him to a special school on the mainland. Jesse’s psychology is a metaphor for being on an island of your own devising – nice although perhaps a bit strongly done. There are a number of other characters who either try to convince him in one way or another, including some seriously violent threats, and the tension slowly mounts – very slowly. Queenie Coffin and the Priddle Brothers are especially threatening. Others have varying reactions. The emphasis here is quite often on the past – in Moses’ memories and it’s sometimes hard to tell as the man’s mind goes in and out of the present – it seems the past is more real to him than the present – certainly more real than the anticipated future. To a point yes, it interferes with the tension. But the real point is that the small, isolated and tightly knit community is an organic essence; it’s a character in a very real sense with a history which is hugely meaningful to Moses. Crummey delves into the past in order to give the reader a sense of that history – to make the community real. This is a love-letter to the communities which were destroyed in the 20th century resettlement projects of Newfoundland. 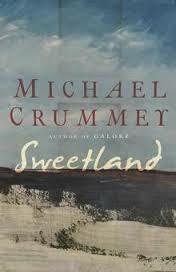 I loved Crummey’s prior book, Galore, and this one is good but it’s not up the standard set with that one.